This picture taken about 1914, in front of the Erven home. The two little girls are Lena and Etta Wilson, then Margaret Erven, Charley, Bob and Bill Erven are the little boys, then James Erven and Mr. Wi/son. Mabel married James Labbar and they have two sons. Ethel married Ward Meadows and have three children. Thomas born in 1877, passed away in 1914. John was born in 1879, and he married Eva Wark, born 1890. John farmed in Clanwilliam till 1912. Moved to Robart, Saskatchewan but the country area was too dry so they moved back to Minnedosa. They farmed till . 1928, when they moved to the S.W. 26-17-18W in the Rural Municipality of Clanwilliam and carried on till 1938. Then John with son Roy and wife Annie moved to Birch River, Manitoba. John died in 1963, and was buried at Birch River, Manitoba. They had three children; Arthur married Leona Hogue from Alberta. Art was in the instruction business in Winnipeg. Now retired and living in Victoria, B.C. They have three girls; Marlene, Donalda and Judy. Marlene married David Johnston and have two girls and they live in Mission, B.C. Donalda married Byron Buie and have two children and they live in Vancouver, B.C. 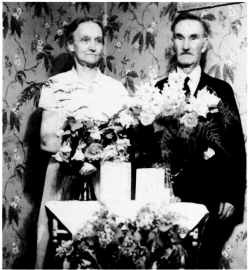 Judy married Gerritt Blankert and they live in Calgary, Alberta. They have two children; Raymond married Anne Landstrom. They lived at Erickson and in 1938, moved to Birch River and retired at The Pas in 1968. Ray passed away in 1981. They had seven children; Wanitta, Myrna, Marilyn, Wayne, Clare, Carol and Bob. Thelma married Herbert Drake. They had no children. Thelma passed away in 1975. Harriet was born in 1884. She married Richard Sherman. They had one daughter Margaret. She married John Hook. They have one child. John Andrew married Mary, nee Nielsen, and they came to the Rural Municipality of Clanwilliam and filed on a homestead on N.W. 12-17-17W, 1889, and received title on December 7, 1892.
passed away on January 22, 1894 and is buried at the All Saints Anglican cemetery, Clanwilliam. Protz Ewasiuk came to Canada at the age of 35 in 1901. He came by ship to Halifax and then by train to Winnipeg and on to Kerr's Lake with friends and relatives from Olchowetz, Western Ukraine. His wife Maria and children; Anne, Jesse and John (2 years old) came on the voyage. Maria was pregnant and sick the whole trip. They homesteaded on the shores of Kerrs Lake, S.W. 36-17-17W and children Mike, Nick, Bill, Edith (Pearl), Lena, Metro and Nellie (Refer to Solodian, Nick and Nellie) were born on the homestead. Daughter Anne died of pneumonia in 1914 and her daughter Maize, a year old, was raised by the grandparents. Sons Mike and Nick died in 1917 during the flu epedemic. Son John served in both World War I and II. Their first house was a log shanty and was destroyed by fire about 1920 and a new log house was built. Protz died in February, 1938 at the age of 72 and Maria went to reside with daughter Nellie and Nick Slododian. She died in 1945 and was buried at Kerrs Lake cemetery beside her husband and near their homestead. Pray as if everything depended on God - it does. Work as if everything depended on you - it does.